It will be a bit before I get to the shelf with Somerset Maugham but as I write this post I have the film adaptation of The Painted Veil on in the background. I read the book years ago and have seen the film before. I think both are pretty brilliant. The story is a little insane. It would make a wonderful opera I think. So much tragedy and star-crossed love. It is rife with musical opportunities. I picture both Kitty’s husband and her lover as baritones, Mr. Waddington is a tenor for sure. Doesn’t leave much room for any soaring tenor arias, but they don’t always have to be the stars. Kitty is a soprano of course, and then there are choruses of nuns and Chinese peasants and soldiers. It would be perfect. 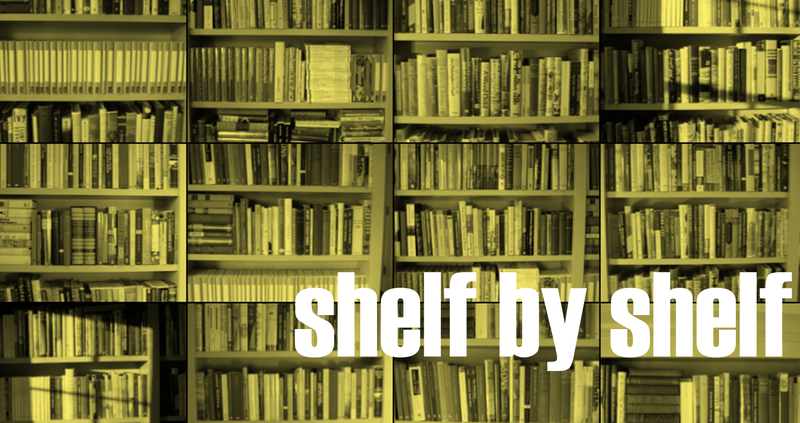 Up to now, although I have really enjoyed doing shelf by shelf, I feel like I have only talked about books and authors that I always talk about. I know this isn’t entirely true, but with this shelf, I am really excited. Part of it is the variety and part of it is that there are so many books here that I really love. Don’t forget to click it. Plenty of room to zoom. One of my favorite movies of all time is the adaptation of Dinesen’s short story Babette’s Feast. I’ve seen the film more times than I can count but I have yet to read the story. I also haven’t quite gotten through Out of Africa either. Or did I finish it? That’s not a good sign. Another example of my shelves not telling the whole story. In addition to the ones noted here, I have read four more. Although I tend to like all of her novels I really, I mean really, loved The Pure Gold Baby and to a slightly lesser degree The Seven Sisters. I need to reread the latter to see how I feel about it since reading the former. A wonderful, funny, romantic coming of age tale. Growing up black and gay in the 1980s. The first four of these titles make up Durrell’s vaunted Alexandria Quartet which counts for one of the Modern Library’s Top 100 Novels of the 20th century. I really need to read them again. They aren’t the easiest to follow but I loved how atmospheric and poetic they are. I somewhat enjoyed The Mill on the Floss but keep getting stuck on Middlemarch, which, by most accounts is one of the greatest English novels of all time. I’m hoping an audio version will help me get over the hump. This NYRB Classic is a wonderful mid-century whodunit. No, it’s actually a we know whodunit but wonder if the innocent guy is going to get framed for it. Love this book. I really loved Then We Came to the End. Many didn’t, in part because of it being written in the first person plural. It has my favorite opening line of all time: “We were fractious and overpaid”. I liked The Unnamed, but much less then TWCTTE. His third book rubbed me the wrong way and I didn’t even finish it. Much more of him on the next shelf. Stay tuned. Very nice! I have those Durrells too and keep meaning to start them, but get distracted. Maybe the summer holidays will be the right time! I think you definitely need to be in the right mood for them. I love your bookshelves, always find them interesting. I loved the film ‘Out of Africa’ but have never got around to reading the book. I have just read ‘Circling the Sun’ by Paula McLain; it’s the story of Beryl Markham which is of the same time and place as Karen Blixen. I found it absolutley fascinating. My favourite authors are women from between the wars. I think that it was a particular good time for that genre. Do you agree? I do agree about women authors from between the wars. I tried reading Markham’s West with the Night and had trouble getting into that one as well. I’ve never thought about books being turned into operas – as a huge opera fan this is clearly remiss of me! I also love Babette’s Feast. In terms of Out of Africa, dare I say that the movie is better than the book?! (It is… Because Meryl. Because Robert). I usually think about turning them into movies and only occasionally into operas. In fact I thought this about The Painted Veil when I was an undergrad which was about 25 years ago. That’s probably the last time I thought of turning a book into an opera. Never heard of the Fearing, but it sounds fabs. Also, you are SO restrained with the number of books you’ve kept. The idea of getting from D to F (er, as it were) in a single shelf is very alien to me. Physical limitations have more to do with it than restraint. Yes, Babette’s Feast was a great film. I read Middlemarch as an audio and just loved it. I find it is easier to separate characters if I can hear their voices. I will follow along in the book when I do listen to Middlemarch. Dinesen and Durrell are two favorites. I’ve been lucky enough to spend time in Alexandria, and when you’re there it’s something of a game to find traces of the magic city about which he writes. They’re there, but you do have to look. As for Out of Africa, it’s more a portrait of Karen Blixen’s experience than a factual account of her Kenya years, but tremendously beautiful. And while I adore la Streep, and the movie is fun, it’s hugely un-Dinesenische (in large part because a big blond American Denys Finch Hatton, even if he’s Robert Redford, is just wrong – shame we didn’t have the run of Brit leading men that are everywhere these days back when they were making it). Babette’s Feast does a much better job of retaining the author’s voice, even if it’s not in Meryl’s dulcet tones. Babette’s Feast is brilliant in part because it doesn’t have big stars in it. Except for the ones they look at in the sky after the feast. Another interesting shelf Thomas. I recently picked up “The Pure Gold Baby” and hope to start on it in about a week. I think you may have mentioned it in an earlier post. It will be my first encounter with Ms. Drabble and, after reading your comments above, I am looking forward to it. Right now, I am still, slowly, working my way through “Phineas Finn”. Cheers! I know others who were luke warm on The Pure Gold Baby so it may not be your cup of tea. PF is indeed a bit of a slow one. I really like the sound of The Big Clock. I will have to keep my eyes open for that when thrifting or maybe I will break down and buy the NYRB edition; they are always so lovely. I also like the look of the Durell paperbacks, both their colors and font and the state of wear. They look well read in a good way. I “have” to read them as well for the Modern Library’s Top 100 Novels of the 20th century. I started Justine years ago but never finished. Good to know going in that they are more poetic than plot driven. I can adjust my expectations accordingly. They are the Faber edition. For the longest time I only had 3 of the 4 in that edition but finally found the missing volume. They did a very similar version in hardback as well, but I will pass on trying to collect those. Just this weekend I was at a book sale at my local elementary school and they had 3 of the 4 in a more modern edition. I rearranged the table putting the three together and was troubled I couldn’t find the fourth so that potential buyers would know they were a set. I was a b it underwhelmed by the Alexandrias – I had them in the Faber edition too but I didn’t read them together and got v confused. I hope you manage Middlemarch, though – one of my all-time favourite books. It was my only one of hers I read for years (I re-read it a few times), but now I’m picking them up as I see them – I was given Daniel Deronda a few years back and LOVED It, loved Adam Bede a couple of years ago, and have Mill on the Floss bobbling towards the top of the TBR as I speak. I just looked, btw, and to get from DI to FI in my fiction shelves would take me … oh, that’s surprising, just under one of my shelves. Not many E authors out there! I have yet to see or to read Babette’s Feast, but it’s been higher on my radar lately. Should I duck as I admit that I’ve never read any Margaret Drabble? Middlemarch turned into a slog-fest for me — I would recommend the watching the miniseries instead. ;) I was thinking I had read Durrell, but a check into my records proves me wrong — it was Gerald Durrell that I read. Did you ever read The Count of Monte Cristo by Dumas? I remember you talking about it, but don’t remember if you finished or if you liked it. That would probably go on my “favorite books” list if I ever made one. It takes a while to get into, but then the pages start to fly. Loving these shelf reports (but I’m behind a little, apparently). With daylight now already being nearly 22hrs long (it’s light long after sunset, and long before sunrise), we’re outdoors so much at this time of year, and especially as the weather is exceptionally good. So I’m behind on reading of any kind – including blogs. Thus just catching up on yours now, Thomas! Concerning Durrel, I have to say that, like most Brits, we think first of Gerald (of My Family and Other Animals fame), and only of Lawrence if we have a literary leaning to our tastes. I find Lawrence heavy going. As regards Middlemarch, well George Elliott has a fairly dense writing style : what is notable of her work is not its literary quality, but rather the characterization and narrative which – as was certainly true of her own life – challenged Victiorian mores. My favourite is Silas Marner, which is wonderful story which also has the advantage over Middlemarch of being short. There were BBC adaptations of both these novels, made in the 1980s or 90s (we’ve recently bought both new on DVD) which we felt help warm the heart to be more receptive to the hard reading!